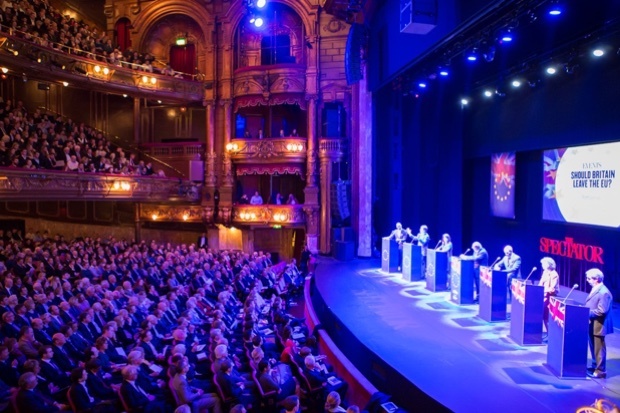 Yesterday saw perhaps the largest EU referendum debate in the campaign so far, with over 2,200 people packed in to the London Palladium to see two teams battle it out at the Spectator Brexit debate. Andrew Neil, in the Chair for the event, assured attendees that this was the biggest ever event in the Spectator’s long 188 year history and, unsurprisingly, proved to be an able mediator in what was at times a fiery occasion. The Leave team consisted of Nigel Farage, Kate Hoey and Dan Hannan; and Liz Kendall, Nick Clegg and Chuka Umunna were team Remain – note the lack of a Conservative Party representative on the ‘In’ team. The evening began with five minute statements from each team member and Leave got off to a strong start with Nigel Farage abandoning his podium to deliver his speech without notes, and both Hoey and Hannan’s statements were well received. Indeed, the combination of passion and humour in Dan Hannan’s speech received the loudest applause of the evening, with his appeal for the British people to acknowledge our strength as the fifth largest economy in the world and the fourth largest military power at times drowned out by cheering. In contrast, Kendall, Clegg and Umunna’s opening statements failed to ignite the audience in the same way with much less humour and patriotic rhetoric being deployed. Their key arguments focused on the need for the UK not to isolate itself from its neighbours in these uncertain times and also featured repeated references to the numerous world leaders, organisations and institutions who have all publically backed Remain. Following the opening statements, Andrew Neil began his questioning with all those on stage being interrogated on how Brexit would impact a range of issues including immigration, the economy, the UK’s ability to tackle terrorism, the potential breakup of the United Kingdom and global stability. The Remain team’s trickiest moment came following a question on how the UK would be able to control immigration in the event of an ‘in’ vote with Liz Kendall floundering under intense questioning from Andrew Neil. This can be seen as reflective of one of the Remain campaign’s weakest points. With immigration regularly recorded by opinion polls as one of the most significant issues to voters we can expect immigration to continue to feature prominently in the remaining months of the campaign. Dan Hannan attempted to differentiate himself from Farage on this issue by claiming that he wanted the UK to be able to take more migrants from non-EU countries. One of Nigel Farage’s most notable contributions came in the form of controversial comments on Russia’s annexation of Crimea. Farage suggested that the EU had acted in a reckless and provocative manner towards Russia which had resulted in the Crimea crisis. Clegg immediately condemned these comments, stating that it was completely unacceptable for the UKIP leader to ‘make excuses’ for Russia’s actions in Ukraine resulting in very loud and sustained applause from the sell-out audience. The evening concluded with the audience holding up cards to reveal whether they backed ‘Remain’, ‘Leave’ or were still ‘undecided’. The result was a solid win for ‘Leave’, perhaps unsurprising given the Spectator’s historic position on Europe. However, the number of ‘undecideds’ following almost two hours of debate was notable. In summary, the debate itself was a clear victory for the Leave team with Dan Hannan proving to be their star player. The Remain team failed to match the passion and persuasiveness of their opponents and the event gave a taste of what to expect from the BBC’s Brexit debate which will be held in front of an audience of 12,500 at Wembley Arena on 21st June. Whether the Government sends a representative to this debate remains to be seen.